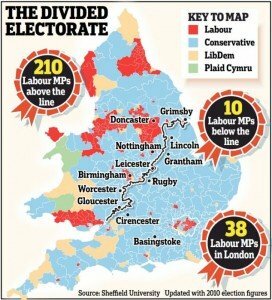 It’s probably the case that a majority of people in Wales and Northern England actually agree more with Scotland than with London, but given that the Tories are essentially a Southern English party (see the map above), and that Labour are forever chasing the swing voters in Southern England, they have unfortunately handed over the power to make this decision to London. Only in Scotland have we got a chance to choose a different route, which is why we have to vote Yes now, before the process of becoming Freeport Ho! makes it utterly impossible for Scotland to make a different choice.